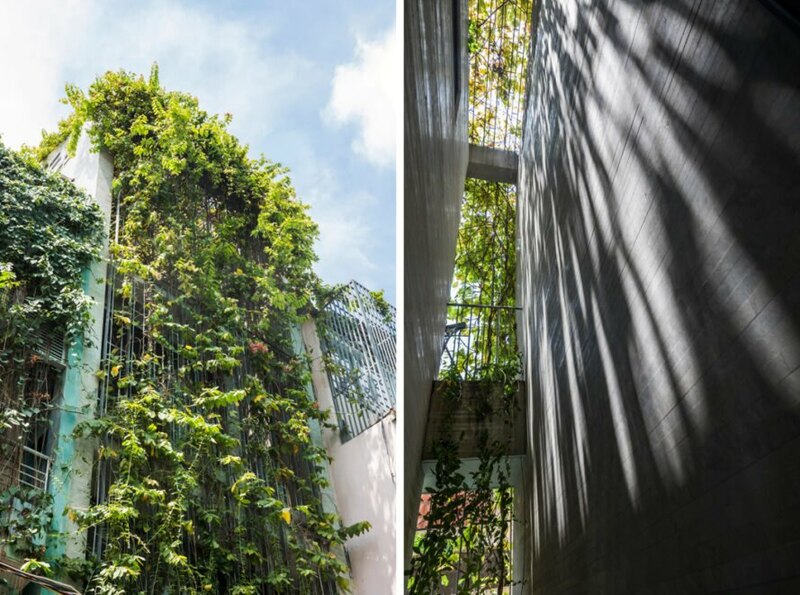 In the heart of Ho Chi Minh City’s concrete jungle, a compact family home has been infused with greenery thanks to the work of Vietnamese architecture firm Vo Trong Nghia Architects. Dubbed the Breathing House, the property is located in an extremely dense neighborhood on a plot measuring just 12.8 feet in width and 58.4 feet in length. 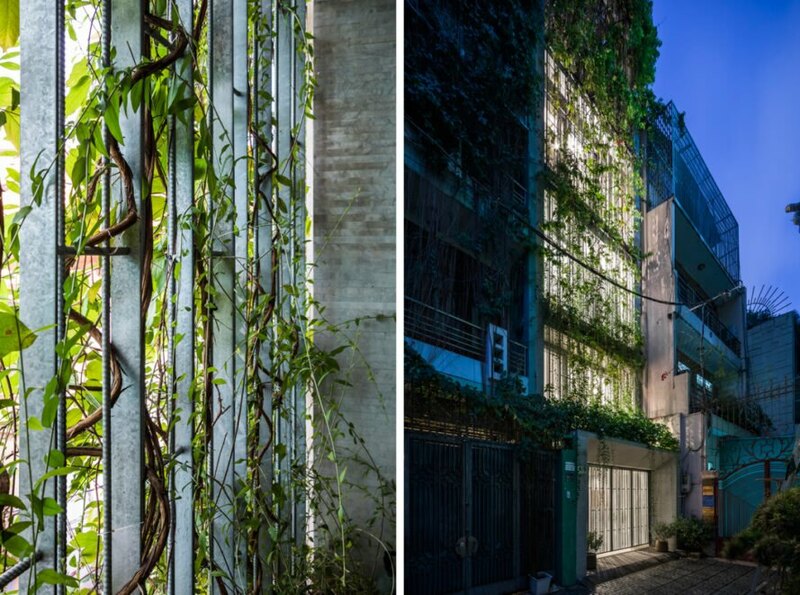 To provide a connection to nature despite the constrained urban conditions, the architects wrapped three sides of the home in a “green veil” made of creeper plants that grow on steel mesh. Edged in by buildings and accessible only via a tiny alleyway, the Breathing House makes the most of its small footprint with a staggered floor plan arranged around light wells that let natural light and ventilation deep inside the home. To open three sides of the house to the outdoors without compromising privacy, the architects wrapped the facade in a vertical green screen that not only protects against prying views, but also helps mitigate solar heat gain and improve air quality. This “green veil” was constructed using a modularized galvanized steel mesh and planter boxes installed at every floor. 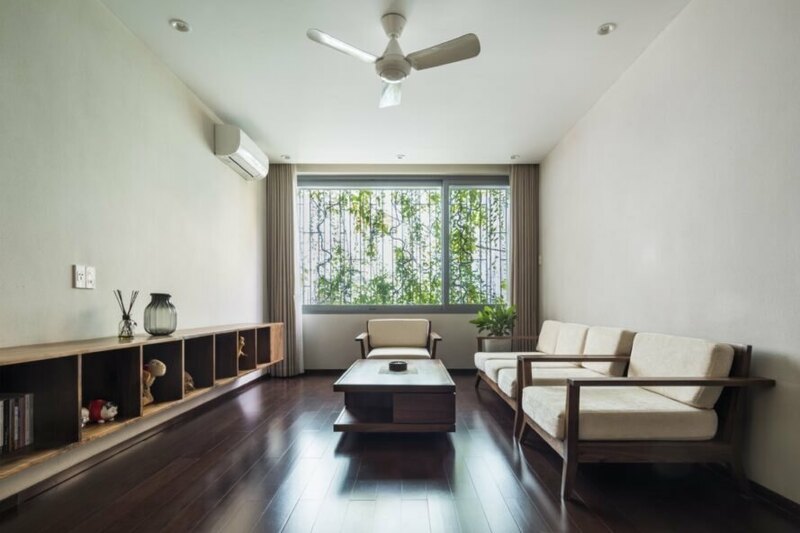 The “porous” arrangement of spaces helps create a sense of spaciousness in the home while reducing dependence on air conditioning. The “green veil”, which is visible to passersby, continues up to the roof terrace, creating what the architects said is a much-needed green space in a city that’s been losing green spaces at an alarming rate. 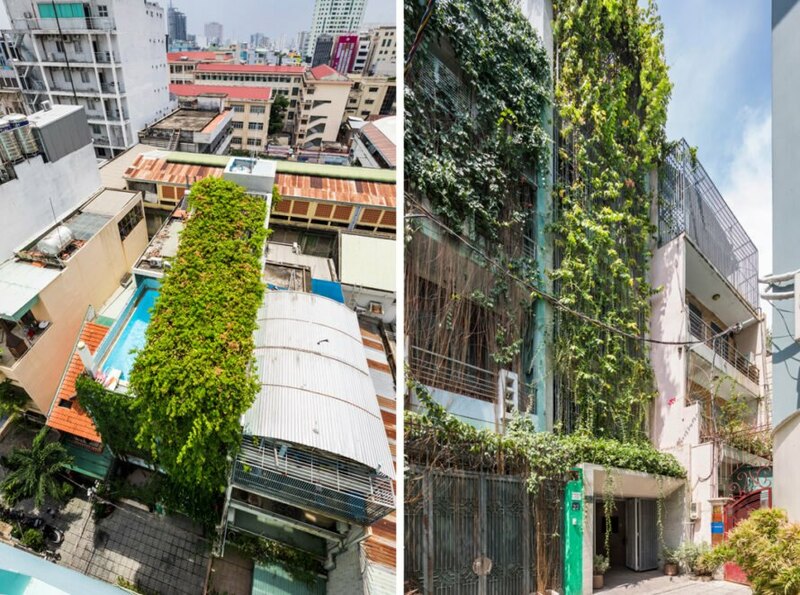 Vo Trong Nghia Architects created this narrow home in the heart of Ho Chi Minh City. The structure is covered in creeping plants. The green wall provides privacy for the residents. The greenery also facilitates the flow of natural ventilation. The green veil offers much-needed green space within the city. 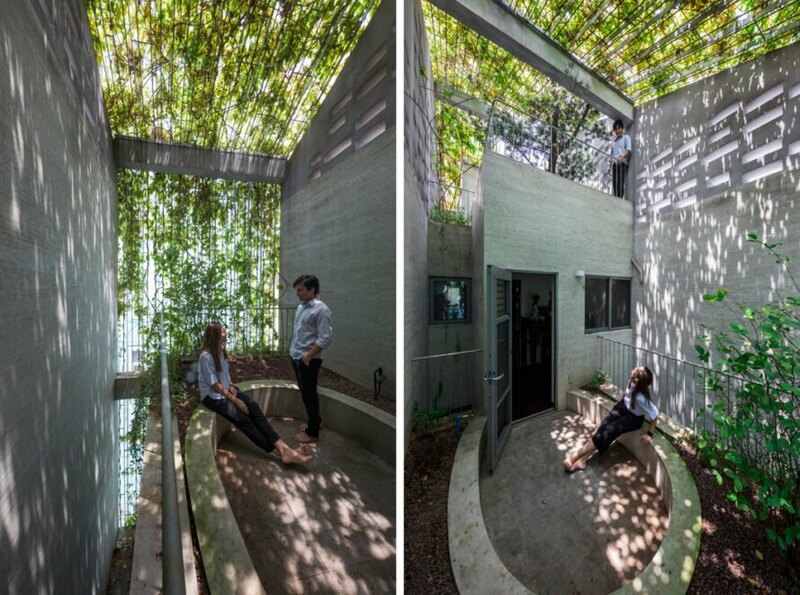 Three sides of the home are wrapped in the plants. Neutral colors and materials inside allow the greenery to really pop. The home is quite calming despite the hustle and bustle right outside. Natural light is welcomed into every room. 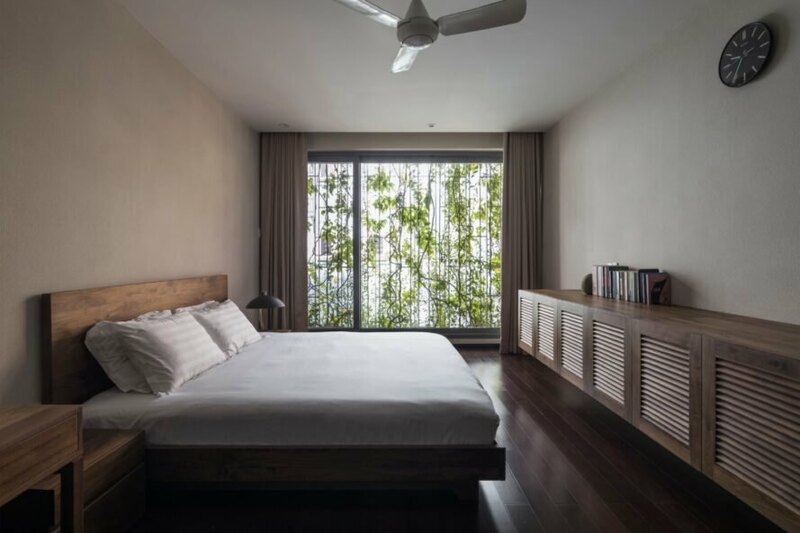 The lush plants improve the home's energy efficiency and the living environment as a whole.